As a young child, Shokoufeh Mirzaei was initially terrified of airplanes. Growing up on Air Force Bases in Iran, she would routinely seek shelter underground as air raid sirens went off. However, that fear soon turned to admiration and a desire to fly. Immigrating from a country where it was formerly impossible for young woman to become pilots, Shokoufeh's piloting dreams were put on hold for many years…until now. Frederic Hewett has a fascination with languages and has perfectly integrated this passion with his love for aviation. When not preparing for his private pilot check ride, Frederic provides English as a second language tutoring to foreign pilots, helping them prepare for their written exams. His goal is to create a communication training program to be able to "strengthen general aviation resources and camaraderie between people of different countries." These two student pilots shared a determination and tenacity that paint a clear picture of their potential impact on general aviation. The committee for the 3rd annual Get into the AIR scholarship whole heartedly decided that two scholarships must be awarded this year to both deserving future pilots. Applicants were judged on essays and recommendations letters that best portrayed the pilot's goals, drive, and commitment to the aviation industry. The competition was fierce, and AIR was impressed by all the applicant submissions. Since 1999, AIR has remained closely connected to the industry they serve, many of their customers are friends and some are even family. This is because all the agents at AIR are pilots and understand the needs and challenges in owning or renting an aircraft and aviation related businesses. 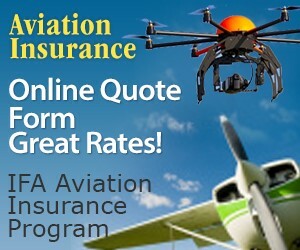 AIR is also IFA's Aircraft Insurance Program provider. For updates on future scholarships or an aircraft insurance quote call 877-247-7767 (be sure to ID yourself as an IFA member) or fill out a quote request online today! Q. I have a third class medical certificate due in six months. Will I be able to renew my certificate with the above listed medical condition [Macular Degeneration]? If the answer is yes, are there additional tests or information required? Thanks. A. I apologize, but there is insufficient information here for me to advise you. The best course of action is to discuss your situation with your AME. You should bring a copy of your most current ophthalmology evaluation. All of these cases are considered on a case-by-case basis.